Orthoscopic Eyepieces – Back to the Future ? If like me you opened up your bright new shiny HEQ5 mount and found yourself stumped by the “Polar Alignment” instructions then this page is for you !! 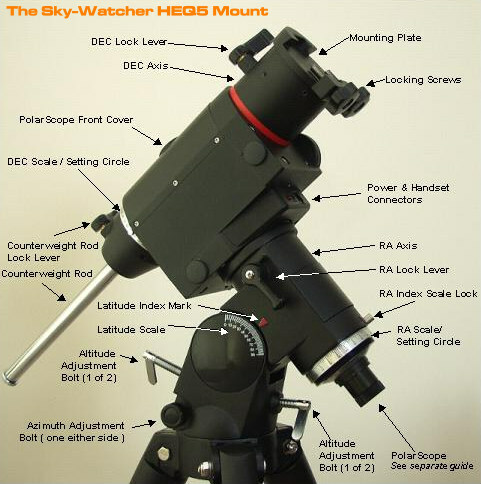 Rather than use technical jargon I have kept this simple and its a basic step by step guide to setting up the polar scope on the popular HEQ5 Mount.This seems to be a common problem judging by how many times it appears as a question on astronomy chat and help boards so here you are – if you have made it to this page then your problems are ( hopefully over ) – at least if you live in the Northern Hemisphere – this guide only works for setting up in the Northern Hemisphere. NOTE: Its easier to do this procedure without the telescope or weights on the mount. This puts less stress on the altitude and azimuth bolts both of which are quite soft and prone to shearing if placed under too much stress it also makes it less likely you will hit your head on the telescope tube and hit the telescope tube against the mount during the alignment procedure. Before starting you will need to remove the covers for the polar scope. The front cover simply clips off, the rear cover has a screw thread. You must also lower the weight bar and rotate the mount through its declination axis until the polar scope is clear. You can check just by looking down the hole underneath the front cover. The first thing you need to do is get familiar with the parts of the mount around the polar scope set-up. I haven’t detailed the altitude and azimuth set up because that’s simple enough even for idiots like me but if your really stuck click the diagram tab titled “HEQ 5 Parts Labelled” (at the top). The polarscope is also simple BUT not well explained on most web pages or the HEQ5 Manual. The diagram to the left shows all of the major components of the polar scope APART FROM THE DATE/LONGITUDE INDEX SET SCREW. If you rotate your mount through its RA access and look at the ring that carries the DATE/LONGITUDE INDEX MARK you will see a small grub screw on the ring that carries the index mark. You will need to loosen this later. Note also the RA INDEX LOCK SCREW will ONLY lock the RA index in its Zero position. You’ll see as you go through the procedure that this is perfectly correct as it is only used in the polar alignment process. Also on the diagram on the left you can only see one of the reticule adjustment screws – there are three of these around the eyepiece of the polar scope. 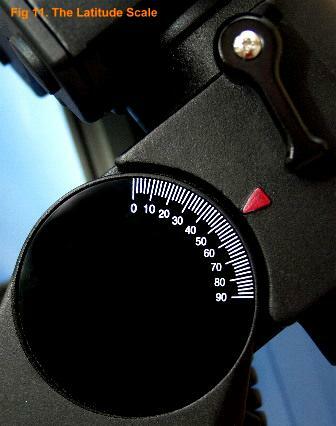 The focus ring can be very stiff when new – turn counter-clockwise to focus the polar scope. Before starting the alignment procedure you will need an Allen key that fits the reticule adjusters AND a small jewellers screwdriver to release the Date/Longitude Mark ring. OK we are now ready to set up the scope for alignment. First you need to adjust the reticule to make sure that its lined up with the mount correctly. You can skip this step if you wish and are planning only to use the scope for observation use rather than photography. Skipping this step will introduce some errors into the alignment but that wont matter very much if you are just observing as you will be able to correct any error via the hand controller. Possibly the toughest and scariest job for a newbie on the HEQ5 is getting the reticule aligned correctly to the mount. Trust me its not as hard as you might think and if you take your time and don’t rush quite a simple job.This is an easier job if done indoors with decent lighting and your adjustment tools by your side. You will need one Allen key to adjust the reticule using the reticule adjustment screws shown above. There are three of these around the eyepiece and you will need to slacken one and tighten the others to take up the slack slowly and bit at a time to get alignment. DO NOT TURN ANY OF THESE SCREWS MORE THAN 1/8 OF A TURN AT TIME or else the reticule may fall out. These screws are quite coarse and are adjusting the reticule by fractions of a millimeter – a small amount of turn make the reticule move quite a bit as you will see.I would also advise to do this with the mount set for zero elevation and with the polar scope almost horizontal. That way if you do end up having the reticule fall out it wont go too far. The manual assumes you will have the mount pointed at Polaris but its far easier to do this task with the scope aligned to a distant object. I use a light on top of a distant radio tower but you can also use a small dot on a white card pinned to a wall. The further away the target object the better. Point the polar scope at the target, using the altitude and azimuth screws on the mount to fine tune. When you look through the polarscope the central area has a cross-hair. Align this over your target as in Fig 1. Now rotate the mount through the RA axis by releasing the RA lock and turning the mount slowly through 180 degrees and then lock the RA axis . Observe the target against the cross-hairs. Chances are it drifts off as in Fig 2. This indicates the polarscope is out of alignment with the mount and will need correcting. To correct this drift of the target from the cross-hairs use an Allen key to slightly loosen the reticule adjustment screw most nearly opposite the cross-hair in the direction by which the the target is ‘off’ i.e. in Fig 2 you would slightly release the screw nearest the 2 ‘o’ clock position. Now tighten the screw that’s nearest to the object you are targeting on. You will find the screws are quite tight and will tend to ‘click’ a little as they are loosened. I use these clicks as a guide in any event – remember never to release any of the screws more than 1/8th of a turn. You need to adjust for HALF the distance that the target has drifted. As an example in Figure 3 adjust the target to be halfway along the red line. Now release the RA lock and rotate the mount back to its original position and re-lock the RA. Realign the target on the cross-hairs and now release the RA and rotate the scope again. If the target still drifts you will need to keep repeating this until the target stays on the cross-hairs as the mount rotates. With a little experience and taking things slowly you will achieve a good accuracy in quite a short time. In these examples I have shown the target as drifting by a huge amount to illustrate the point. In reality you will find the drift is very small and quite easy to correct. Once done I usually put a small amount of tightening to each Allen bolt and recheck. DO NOT OVERTIGHTEN as you will damage the reticule. OK you’ve aligned the reticule and now your ready to set the polar scope up to locate Polaris. Heres how…. 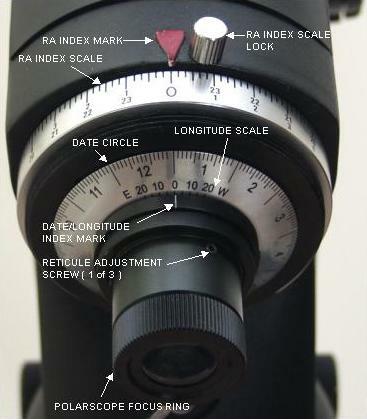 The first thing you need to do is release the RA lock, look through the polarscope ( focus it as you require ) and turn the RA axis until Polaris is at the bottom of the view ( see fig 4 ). Now lock the RA down. This is the point when Polaris is highest in the sky and its called a ‘transit’. You may wonder why its at the bottom – well a polarscope is like any telescope and shows things upside down unless corrected with a correcting prism. The polarscope doesn’t have a correcting prism so what your seeing is wrong way up. With the reticule showing Polaris at the bottom and the RA locked turn the RA Index Scale round until 0 is under the RA Index Mark. Now with the RA scale at 0 against its index mark lock the RA scale using the RA Index Scale Lock as shown in Fig 6. We now need to set a date and time for a known transit of Polaris. For the sake of this tutorial and ease of visibility on the accompanying pictures we are going to set a transit time of 23:00 on October 10th. To set date and time simply turn the Date Circle ( Fig 7 ) until the date you require is in line with the time you require for transit. The date circle is divided into months and days with markers for every 2 and 10 days. setting the RA scale You can see in Fig 7 the Date Circle being turned to its setting for the transit time of 23:00 on October 10th – i.e. the time shown on the RA Index ( 23:00 ) lines up with the Date shown on the Date Circle ( i.e. 10th of the 10th ) in Fig 8. The RA Index has two sets of numbers. The upper numbers are for the Northern Hemisphere the lower numbers are for the Southern Hemisphere. How do you know what time and date to use as a transit ? To find out what time and date Polaris is in transit you will need either a star catalogue/almanac OR a quick way is to use a program called PolarFinder. 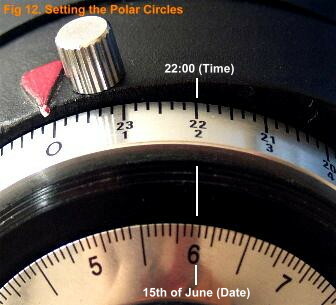 You can get this free on-line from setting the time/date circle on the polarscope www.polarfinder.com Using PolarFinder you can find a time for transits at your location and simply set up the polar scope circles on your mount for your own time and date. Remember to compensate for Summer Time or Daylight Saving Time and use GMT only if your in the UK. Note: I would advise you ALWAYS scan any downloaded programs for virus/spyware threats before running them. With the date and time set as per Fig 8 you now loosen the Date/Longitude Index Mark ring by loosening its set screw ( its a small recessed screw on the same ring as the index mark ) you will need a flat bladed jewellers screwdriver to release/lock this. 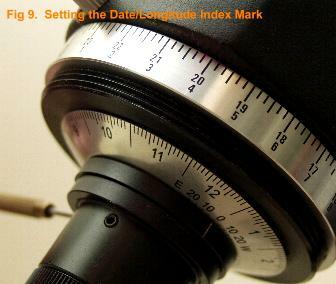 Unlock the ring that contains the Date/Longitude Index Mark and rotate it until the mark is opposite the 0 on the longitude scale as shown in Fig 9. Be careful as you do this you don’t move the Date Circle. Now lock the Date/Longitude Index Mark by fastening the locking screw. setting the date circles index mark The purpose of the two locking positions on the RA INDEX and the TIME CIRCLE is simply so you have a reference point if the circles get moved. If the circles are moved simply set both circles Zeroes to their respective index marks i.e. RA Index Scale is set to 0 against the RA Index Mark and Date Circle is set to 0 against the Date/Longitude Index Mark. In these positions everything is calibrated and ready to use. You will see how on the next page. IF YOU LIVE IN THE GMT TIME ZONE YOUR DONE FOR CALIBRATION OF THE POLARSCOPE…..
For people living in a different time zone you may need to adjust for Longitude Offset – this is described below. 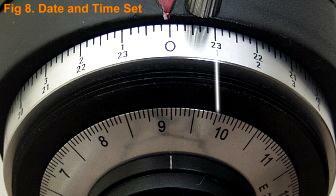 The alignment procedure requires that you set the Longitude scale to “Zero”. Depending on where you live, “Zero” can be anyplace between the E and the W on longitude scale, so first you need to determine where zero is for your location. Your Zero point is equal to the difference between your actual longitude and the longitude of the central meridian of your time zone. To calculate the longitude of your central meridian, multiply your time zone offset from Greenwich Mean Time (GMT) by 15. For example, in Waterloo, Ontario, Canada (Eastern Time) the time zone offset is -5 hours. Ignore the sign and simply multiply 5 x 15 = 75.The longitude of the central meridian for the Eastern time zone is 75 degrees west. The actual longitude at the viewing location in Waterloo is 80 degrees 30 minutes West. Ignore the 30 minutes and just use 80 in the equation. Now it’s simple, 80 – 75 = 5. Since 80 is greater than 75 the result is positive 5. That means Waterloo, Ontario is west of its Central Meridian. In this case, the zero point is at the “5” mark on the W side of the scale. If the location was east of its central meridian the equation would yield a negative value. In that case the E side of the scale should be used. Your almost there….the mount is now calibrated and now we are ready to set up and align on Polaris and thus the North Celestial Pole or NCP. If you have carried out the previous steps this next section tells you how to set up the scope to align on Polaris ready for observing. Ideally for this stage you will have a bubble level or spirit level and for the complete novice a compass is useful. 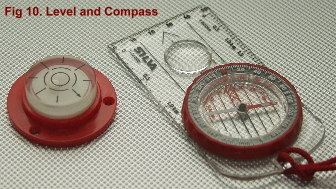 A typical bubble level and compass of the type I use are shown in Fig 10. OK from the previous steps you have all of the data calibrated into the setting circles and can align to Polaris accurately using the Polar scope and the polar scopes setting circles. Before you do that you need to make sure your mount is level ( that’s what the bubble level is for ) and that you are pointed North ( that’s what the compass is for ) don’t worry – you don’t have to be too accurate on this step. Once the mount is level and facing north you need to set your Latitude on the Latitude scale. This is shown in Fig 11. I am located at Latitude 51 degrees. You will need to locate your own latitude for your location. This is easily available from Google Earth or almost any on-line streetmap. Elevate your mount using the altitude adjustment bolts until the correct Latitude for your location is showing. Again this doesn’t have to be too accurate. NOTE: When you adjust the altitude or azimuth bolts you must remember to screw the opposing bolts in the opposite direction until alignment is complete and then lock them up against one another to maintain the alignment. We are almost ready now. Make sure both your RA Index Scale and the Date Circle are set against their respective Zero marks ( e.g. 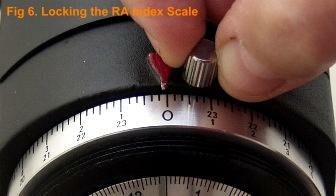 RA Index Scale is set to 0 against the RA Index Mark and Date Circle is set to 0 against the Date/Longitude Index Mark. ). Make sure the RA scale is locked using the RA Index Scale Lock screw. Now rotate the RA axis of the scope until the date on the Date Circle and time on the RA Index Scale align for the time you are observing. 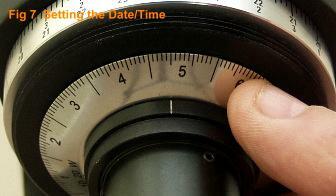 As you rotate around the RA axis only the date circle will move. the RA scale will be locked. For example – assume you are out and wish to align to Polaris. The date is the 15th of June and the time is 22:00 GMT ( or whichever time-zone you set your mounts transit time for ). 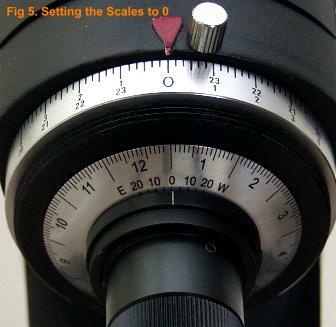 Make sure the RA scale and Time Date scale are at their respective zeros ( see previous page ), lock the RA scale and rotate the RA axis ( NOT THE SCALE ) until 15th June is level with 22:00 – see Fig 12 for how the scales will look. Now lock the RA Axis. Don’t worry about the scope ( if its attached and now pointing in an odd direction – this is only to align the mount ). Now with the scales set at your correct date/time and the latitude set correctly and the polar scope pointing north you should be able to locate Polaris. Look through your polar scope and centre Polaris in the small circle marked ‘Polaris’ using your altitude and azimuth bolts. Your done. You have successfully set up the mount, located Polaris and fixed it and thus the NCP. You can monitor how close the tracking is by looking at Polaris and watching it move. If everything has been set correctly you will see Polaris move slowly around the edge of the larger circle that surrounds the NCP. Q How often do I need to set-up the polarscope setting circles ? It depends on what level of accuracy you want. The polar setting circles if done accurately should get you within 5-6 arc minutes of the NCP. Thats plenty accurate enough for observing and short exposure photography. The polarscope circles are not perfect instruments and consequently some error will creep in. Normally I would check a transit time for the time and date when I want to set-up so its as accurate as possible. Q Do I need all of this just to observe ? No, and in fact before I upgraded I would just set my latitude for 51 ( the latitude where I live ), Set the mounts Declination at 90 degrees and point the mount North. Get Polaris into the centre of the view by adjusting the alt-azimuth and go with that. Its good enough for most observing I found. Q What are the star patterns for in the reticule ? Apart from Octans which is used for alignment to the South Celestial Pole ( SCP ) the other two constellations are there for rough alignment. 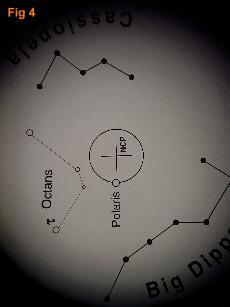 You can match the view you are seeing to the constellations shown in the polarscopes reticule as a rough guide. You don’t actually see the constellations IN the polarscope – you have to look at the polarscope and the sky and compare the two. Personally I find it easier to do the precision type set-up explained in this guide. Can I use this guide to set up mounts other than the HEQ5 ? I can’t say for sure. The HEQ5 and EQ6 mounts are very similar, the Orion equivalents are identical. I know from reading the manual the EQ3-2 is also very similar to the HEQ5 in basic operation. The main difference is a simplified reticule and the fact that the EQ3-2 has no reticule adjustment screws but relies on the polarscope being adjusted by larger external screws rather like a finderscope. The basic principles are the same but obviously there are differences in the way the mounts are assembled and the location of their various controls. Why not share it with the wider community now. We are currently in the process of migrating/refreshing our website. Please bear with us as we upgrade all the articles.